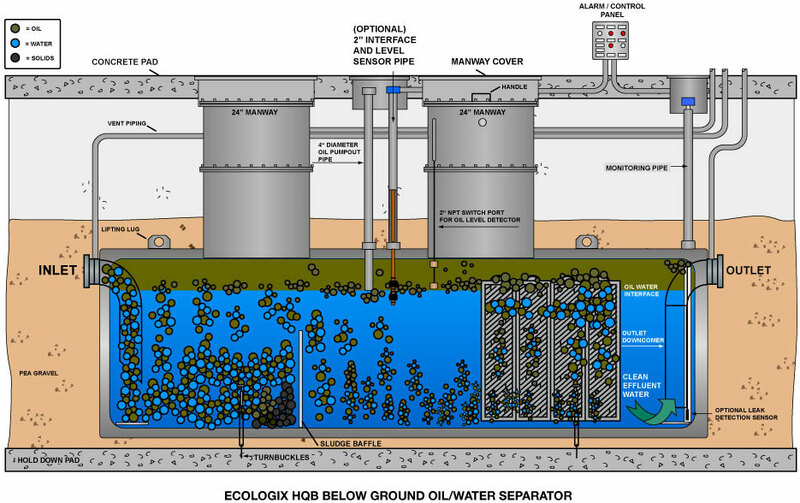 Oil water separators are typically installed in industrial and maintenance areas to capture oily wastewater. Our HQB below ground oil water separators will assist in the removal of large quantities of free and mechanically emulsified oil from your wastewater. HQB Oil Water Separators are versatile and can be used in many different applications. Plasteel Elutron Jacketed Oil Water Separators are in a unique double wall jacketed construction with 360 degree interstitial monitoring. Primary tank of welded steel construction in accordance with UL 58. The steel tank is coated with FRP coating to provide exterior protection to the primary tank from underground exposure. It has been successfully tested to UL 1746 requirements for corrosion protection. Cathodic protection and/or dielectric isolation not required. The Unipack cross fluted plates are manufactured of PVC, CPVC, PP, SS, or FRP. Sizes available up to GPM. The separator is a special purpose prefabricated parallel corrugated plate gravity displacement type oil/water separator designed to remove free and dispersed non-emulsified oil and sellable solids, in accordance with API 421. The separator capacities, dimensions, and construction will be in strict accordance with UL 58, and UL 1746. The inlet chamber will be comprised of a non-clog diffuser pipe to distribute the flow across the width of the separator chamber. The inlet compartment shall be of sufficient volume to effectively reduce influent suspended solids, dissipate energy and begin separation. A sludge baffle will be provided to prevent settlable solids and sediment from entering the separation chamber. The separation chamber will contain parallel corrugated plates for enhanced oil/water separation. The plates will be spaced for optimum removal of free oil and settleable solids, and the corrugations will have a 45 degree angle with respect to the horizontal. Flow through the plate pack will be in a cross-flow configuration. This allows the oil to collect and coalesce in the high points of the corrugations while the solids collect at low points. This also allows oil to rise without interfering. Plates shall be enclosed in a stainless steel frame to facilitate installation and removal. The sediment chamber will be located prior to the separation chamber and will provide an adequate volume and baffling for the settling of any solids. The waste oil storage is an integral part of the separator, and has a capacity of 40 percent of the total separator volume. Oil will flow from the separator by gravity or can be pumped away when the oil water interface reaches a predetermined depth. A clean water chamber which allows the water to leave the separator by gravity flow through the clean water drop tube and outlet flange will be provided. Manways and vaults will provide access into the separator. Each accessway will be provided complete with extensions, bolt down cover, gasket, and bolts. 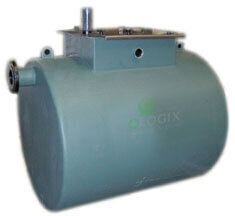 Sufficient size vents are provided with standard pricing. Hold down straps, if wanted, can be purchased optionally. Most extensive performance guarantees offered in the industry. Removes free oil droplets as small as 40 microns. Reduces effluent free oil concentration to 10 PPM or less. Factory tested prior to shipment. Performance Guarantee Based on Influent Characteristics. Elutron tanks carry a (5) five year warranty on material and workmanship and (30) years against external corrosion. P.E. Stamped Calculations for Reynolds Number and Stokes Law.